Green America is a nonprofit membership organization dedicated to harnessing the economic power of consumers, investors, and businesses to promote social justice and environmental sustainability. A business displaying this Seal of Approval have been screened and approved at various levels of their green practices to be listed in the National Green Pages directory. Consumers can feel confident that a business bearing this seal operates in ways that protect the environment, support workers, communities, and you. Native Energy offers carbon offsets and renewable energy credits for the daily energy used in homes & businesses. They help finance construction of Native American, family farm, and communty based renewable energy & carbon reduction projects, thus helping these communties in need build sustainable economies, and provide Native American tribes the ability to share in the business value they create. Through Native Energy’s business partnerships, they build public awareness and promote action in fighting global qarming pollution. The Society of American Florists is the only national, trade organization representing all segments of the US florist industry with the nations top retailers, growers, suppliers, educators, and students. The Green on the Sundance Network Channel founded by Robert Redford is the entertaining and most informative source of inspirational programs about our planet. Founded by Congresss in 1991, the non-profit National Forest Foundation works with the U.S Forest Service to preserve our national treasures. They bring people and communities together to help promote the health and public enjoyment of our National forests and grasslands. 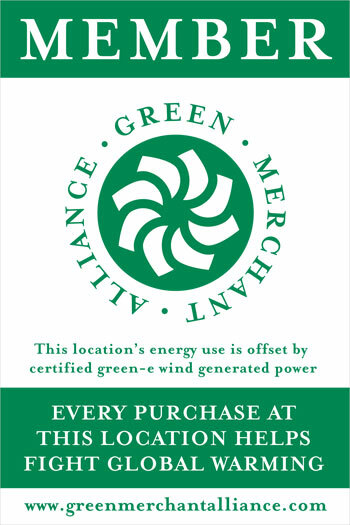 The Green Merchant Alliance is a green payment solution that recognizes each credit card sale with a percentage purchasing renewable energy credits thus reducing the carbon footprint of each sale. The 3/50 project promotes supporting the movement to strengthen independently owned businesses by choosing three local businesses and spending $50.00 in each.